We may now be at a point where we're able to buy a game on launch day without even getting out of bed, but sitting through a ten-minute update when you've already downloaded and installed the thing can be hugely frustrating. However Ubisoft sees it as one of the problems that the new consoles will tackle, meaning less hanging around time and more playing - and giving gamers a much more convenient experience. 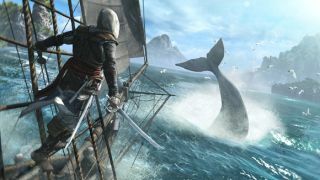 "Auto-updates, when consoles are in sleep mode, and seamless downloads as you play are critical steps to deliver personalised content in the most comfortable manner," Lionel Raynaud, Vice President of Creative at Ubisoft Montreal, told TechRadar on the opportunities of the new consoles. But Raynaud added that the biggest plus of the new boxes will be improved social play. "The biggest benefit of the next-gen consoles is that they'll enable us to create games that are even more social, more immersive and more interactive, which is exactly the type of experience that gamers want today," he said. "The sharing and broadcasting features, made easy and mainstream, will change the way our players discover our games, as they now have the opportunity to watch other players in real time." "We should see this as an amazing show room for living open worlds, systemic designs and multiplayer-oriented experiences where everything the players see invites them to live their own journey in these worlds," said Raynaud. "Our future lies in more interactive, social, deep, and personal experiences,"
Ubisoft released the Assassin's Creed 4: Black Flag DLC, Freedom Cry on PS4, PS3, Xbox One and Xbox 360 earlier this month. As many other developers have already expressed delight at, Raynaud reiterated that the the Xbox One and PS4 design bring them much closer in line with PCs: "The new consoles and PCs share similar architectures so developing games across the different systems is in some ways more efficient than it has been in the past". Looking to spend that Christmas money on a shiny new gaming box? Read our PS4 and Xbox One reviews first.